What Is "SOUND SHORE LAST STRAW"? Sound Shore Last Straw is a waste reduction initiative of Rye Sustainability Committee to reduce the use of single use, disposable plastics that are a permanent addition to the waste stream and a source of environmental pollution. Participating area restaurants and food establishments have pledged to help reduce this unnecessary plastic waste. Residents can join in the effort as well. For more about plastic straw waste and Sound Shore Last Straw, watch Rye TV's Public Service Announcement about the initiative. And read on to learn how you can make a simple change that can yield significant environmental benefits for your community. Americans use 500 million disposable plastic straws/day. Marine animals mistake straws for food and can choke on them. Plastic straws are made from polypropylene, a petroleum-based non-renewable plastic. It's a convenience, not a necessity. For most of us, it's a habit of convenience and habits can be changed! As a coastal community, Rye is exposed to the acute problem of disposable plastic that is used for a few minutes but remains in the environment forever. Plastic straws make the top 10 list of items found on beaches, yet they cannot be recycled. Instead they end up in landfills, as litter, or in the ocean. Americans use and discard over 500 million straws a day – that’s an average of 1.6 straws per person per day! Straws, however, are largely an unnecessary utensil. Most people don’t need a straw in order to easily consume a beverage. In fact, whether a straw is used or not is an arbitrary custom. Think about it: You choose to drink certain carbonated beverages, like sodas, with a straw, but wouldn’t consider drinking a beer, through a straw. However, the vast majority of restaurants automatically serve water and other beverages with a plastic straw. That straw is then tossed away after one brief use. We’ve learned from other communities that have instituted similar straw reduction campaigns that restaurants are actually saving money because they are giving out far fewer straws. Some establishments – even bars! – have completely eliminated straws. The feedback has been positive and has even given a public relations boost for participating establishments. If other communities can do it, so can Rye: Join your neighbors and fellow Rye business leaders by saying "No" to unnecessary waste and saying "Yes" to that Last Straw! 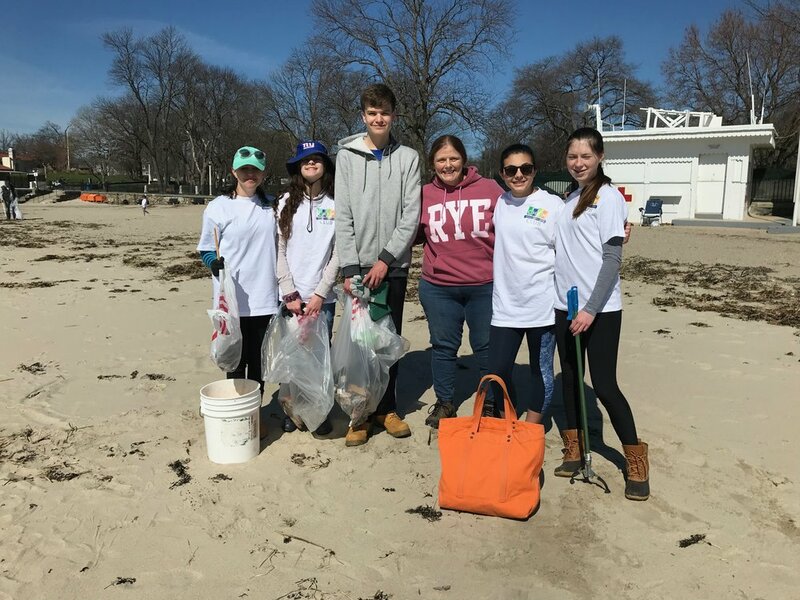 Rye Sustainability, Rye students and Rye Town Park members at a recent Rye beach cleanup. It's really simple: Choose not to use or purchase disposable straws and make the commitment by taking the SSLS Individual Pledge. Say "no thanks!" to straws at restaurants, unless they're reusable (Read here for ideas). Make a straw-free or minimization pledge by completing the form below or completing the printable pledge and mailing it to RyeSustainability@gmail.com. Advertise this policy via in-house signage and/or by printing STRAWS AVAILABLE UPON REQUEST on menus. By making The Last Straw pledge, Rye Sustainability will celebrate you as green business leaders via the RSC website, its social media platforms and through other marketing tools. Say "no thanks" to plastic straws when offered. Choose to use reusable straws when I need one. Encourage friends, family and food establishments where I eat to do the same! Your information will remain strictly confidential and will not be shared with any external entity of any kind. Thank you for taking the SSLS Individual Pledge! On behalf of the Business stated below, I am taking the ‘Sound Shore Last Straw’ pledge and officially participating in this initiative. This Business does this as part of an effort to keep the City of Rye, NY and Long Island Sound pollution free and to help stop plastic pollution at the source. Take the Business Owner Pledge! REQUIRED: Print on menu or tabletop/visible signage “Straws Available Upon Request” and only provide straws upon customer request. OPTIONAL: Discontinue the use and purchase of plastic straws - Offer 100% paper straws OR get rid of straws completely. Thank you for making the Last Straw Business Owner Pledge!